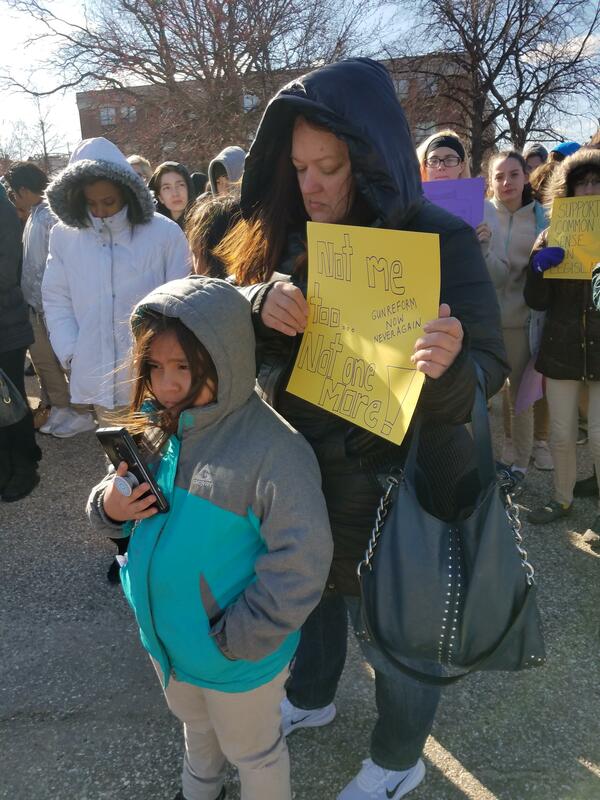 Khloe Bourgerie, and her daughter, Jainicole, a 4th-grader at Hampstead Hill Academy in East Baltimore, walk out of school Wednesday asking local and state leaders to act on stricter gun laws. Lockers slammed shut in the hallways as kindergartners to eighth graders threw on their coats, marched out of school, and crossed the street to Patterson Park at 10 Wednesday morning for 17 minutes, one for each of the lives lost at Marjory Stoneman Douglas High School. Jainicole Bourgerie, , a 4th-grader, says she doesn’t feel safe at school. “I’m afraid someone is going to come in and start shooting,” she said. Her mother, Khloe Bourgerie, came to school to march with her. Asiane Phillips, a 7th-grade student organizer at the school, called on Gov. Larry Hogan to do more for Baltimore. Student organizers say they want to meet soon with Mayor Catherine Pugh and in May with Police Commissioner Darryl De Sousa to talk about making Baltimore’s students and residents safer. The students were among those at dozens of schools throughout the Baltimore region who participated in the walk-out. Harford County students, however, were forbidden from joining the protests. School Superintendent Barbara Canavan sent a letter to parents and students March 7, warning that students who walked out of classes would face disciplinary measures. The ACLU of Maryland responded with a letter Monday threatening legal action if students rights were violated. The ACLU letter from staff attorneys Sonia Kumar and Gina Elleby expressed concern that the "tone and content" of Canavan's letter suggested students who did walk out "may be punished more severely for leaving class that would be the case for any other unexcused absence. Nonetheless, students at several schools, including Havre de Grace and John Carroll high schools did walk out for 17 minutes.